Samples are precious and so is time. Our vacuum concentrators and pumps use state-of-the-art centrifugation, vacuum, and heat technologies for removing solvents and concentrating samples while maintaining sample integrity. From traditional drying down of DNA preparations in water and methanol, to the more complex and aggressive applications presented by the combinatorial chemistry and drug discovery sectors of the pharmaceutical industry, we have the systems for your lab. Thermo Scientific™ Savant SpeedVac Rotors are available in a wide variety of styles and sizes to accommodate all your sample requirements. They are designed to efficiently handle and accommodate microtubes, bottles, glass and plastic tubes, flasks, and even microplates. Individual tube volumes range from 0.4 up to 500 ml. The polypropylene rotors are fully autoclavable. Thermo Scientific™ Savant Refrigerated vapour Traps are available in two temperature ranges. The Savant RVT450 refrigerated vapour trap ranges from ambient temperature to -50°C and the Savant RVT5105 refrigerated vapour trap ranges from ambient temperature to -105°C. Safely handle and recover solvents with the Savant SpeedVac Universal Vacuum Systems, equipped with an easy to use, wide-mouth glass condensation flask. This single integrated unit combines an oil-free vacuum source and refrigerated vapour trap, and can be connected to any of the concentrators to provide a complete SpeedVac system. 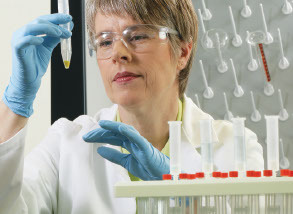 Protect your lab from harmful chemical and radioactive emissions. Chemical traps are highly recommended to absorb residual volatile vapours that may bypass the primary cold trap. Replaceable cartridges install easily inside the trap for quick changes once the trap become saturated. Improve the functionality of Thermo Scientific Savant SpeedVac Concentrators with Savant SpeedVac concentrator accessories. We offer a variety of hand-operated vacuum pumps (with and without gauges), as well as accessories including repair kits and Nalgene™ vacuum chambers and jars.